Monkeys respond to food with the same brain chemicals that humans have. When you know how these chemicals work in monkeys, it's easier to accept your own responses instead of being at war with yourself. 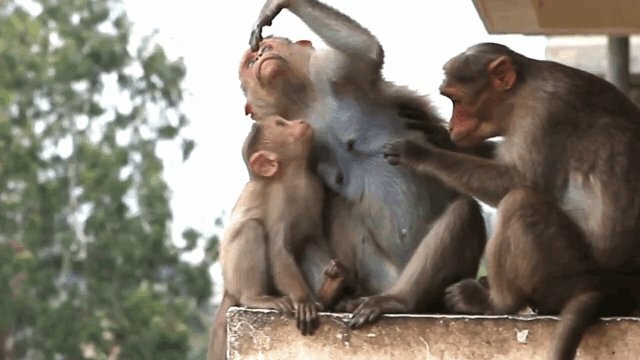 A newborn monkey gets a sweet, creamy treat when it acts on its sucking instinct. That triggers dopamine, the brain's way of saying "Wow! This really meets your needs. Get more of it!" Dopamine paves neural pathways that wire a brain to seek more of whatever triggered it. A little monkey seeks its mother the next time its blood sugar falls. Cortisol rises when blood sugar falls. We associate cortisol with stress, but in the state of nature it warns of urgent survival threats. Cortisol works by causing a bad feeling. It motivates a mammal to relieve it, fast, whatever it takes. Dopamine can relieve it, so cortisol motivates a mammal to do things that have stimulated its dopamine. Unfortunately, dopamine doesn't last. The brain saves it for new opportunities instead of wasting it on the same-old same-old. Fortunately, new things are all around a little monkey. Sitting on his mother's lap, he sees her put things in her mouth, and crumbs fall on her chest just inches from him. His mirror neurons trigger the urge to grasp one of these things and put it into his mouth like he's seen her do. When he does, dopamine! The good feeling motivates him to do it again. I was amazed to learn that monkeys never feed their young except for breast milk. A little monkey only gets solids when he gets it himself. He knows what to pick because he has seen his mother forage so many times. Repetition wires his brain to identify the leaves she chooses and ignore the leaves she ignores. Conscious effort or intent is not needed for a little monkey to learn to meet its survival needs. But a monkey seeks more than survival. It seeks dopamine. Natural selection built a brain that rewards you with a good feeling when you do something good for the survival of your genes. 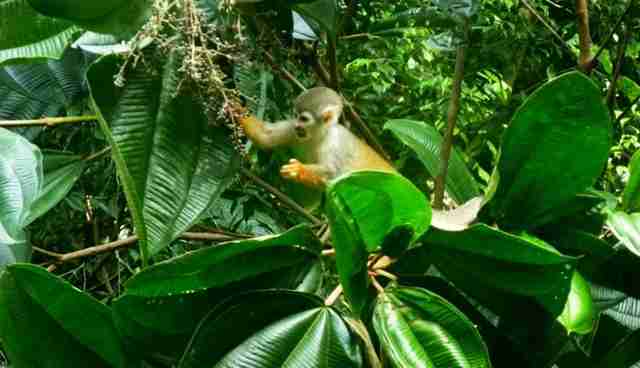 Foods high in protein and calories are good for the survival of a monkey's genes. So dopamine surges when a monkey tastes nuts, insects, fruit, meat or eggs. Alas, these things are hard to find in the state of nature. A monkey keeps trying because getting a step closer to a rich food stimulates dopamine. 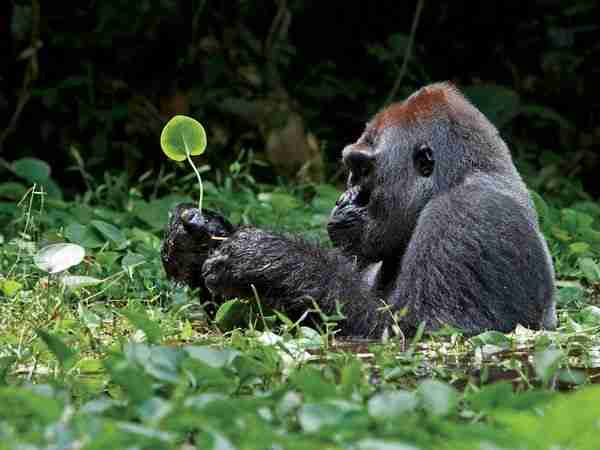 The quest for dopamine can leave a monkey hungry, but eating leaves relieves the cortisol. A mammal saves up energy and then invests it in pursuit of resources that promote reproductive success. Conscious intent to reproduce is not involved. The brain built by natural selection scans the world for ways to avoid bad feelings and stimulate good feelings. When a monkey sees a ripe, juicy mango at the top of a tree, she has to make a decision. Will those branches support my weight? Will another monkey get there first? Her cortisol and dopamine can surge at the same time! Primates evolved a brain to manage such dilemmas. It weighs expected risk against expected reward. When cortisol dominates, it withdraws. When dopamine dominates, it forges ahead. Sometimes a monkey succeeds in its quest and enjoys a delicious treat. But the joy of dopamine doesn't last. It's quickly metabolized, and a monkey has to do more to get more.